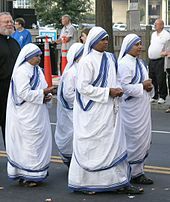 ^ "Mother Teresa | Canonization, Awards, Facts, & Feast Day". Encyclopedia Britannica. Retrieved 2017-05-18. ^ Poplin, Mary (2011-02-28). Finding Calcutta: What Mother Teresa Taught Me About Meaningful Work and Service. InterVarsity Press. p. 112. ISBN 9780830868483. Remember, brother, I am a missionary and so are you. 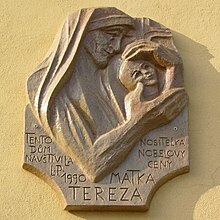 ^ "Mother Teresa". www.nytimes.com. Retrieved 2017-05-18. ^ Allegri, Renzo (2011-09-11). Conversations with Mother Teresa: A Personal Portrait of the Saint. ISBN 978-1-59325-415-5. ^ a b Memorials, Christian. "Mother Teresa of Calcutta Online Memorial Tribute". www.christianmemorials.com. Retrieved 2017-05-18. ^ "Nehru Award Recipients | Indian Council for Cultural Relations | Government of India". www.iccr.gov.in. Retrieved 2017-05-18. ^ "List Of Bharat Ratna Awardees". www.bharatratna.co.in. Retrieved 2017-05-18. ^ Chawla, Navin (1992-03-01). Mother Teresa: The Authorized Biography. Diane Publishing Company. ISBN 9780756755485. ^ Stacey, Daniel (2016-09-03). 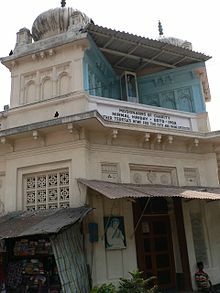 "In India, Teresa Draws Devotees of All Faiths". Wall Street Journal. ISSN 0099-9660. Retrieved 2017-05-18. ^ "Commemorative coin on Mother Teresa released - Times of India". The Times of India. Retrieved 2017-05-18. ^ a b c d Schultz, Kai (2016-08-26). "A Critic's Lonely Quest: Revealing the Whole Truth About Mother Teresa". The New York Times. ISSN 0362-4331. Retrieved 2017-05-18. 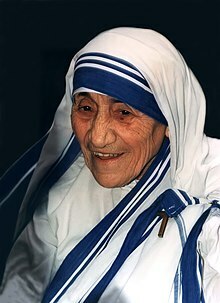 ^ "Was Mother Teresa a saint? In city she made synonymous with suffering, a renewed debate over her legacy". Los Angeles Times. 2016-09-02. ISSN 0458-3035. Retrieved 2017-05-18. ^ Dhar, Aarti. 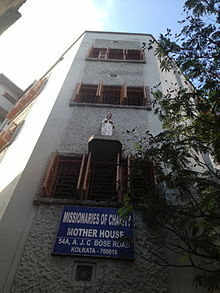 "Mother Teresa's aim was conversion, says Bhagwat". The Hindu. Retrieved 2017-05-18. ^ "RSS backs its chief Mohan Bhagwat's remarks on Mother Teresa, Opposition lashes out at him - Timesofap.com". tsjzcra.timesofap.com. Retrieved 2017-05-18. ^ "Mother Teresa's Message to the Fourth Women's Conference". EWTN. 2006-10-06. Retrieved 2016-03-28. ^ Hitchens, Christopher (December 18, 2015). "Mommie Dearest". Slate. Retrieved December 19, 2015. ^ Lattin, Don (October 12, 2003). "Living Saint: Mother Teresa's fast track to canonization". San Francisco Chronicle. Retrieved September 4, 2016. ^ a b Povoledo, Elisabetta (2016-09-03). "Mother Teresa Is Made a Saint by Pope Francis". The New York Times. ISSN 0362-4331. Retrieved 2016-09-04. ^ a b "Mother Teresa declared saint by Pope Francis at Vatican ceremony – BBC News". Retrieved 2016-09-04. "Whatsoever You Do ..." Speech at National Prayer Breakfast. Washington, D.C.: Priests for Life. 3 Feb 1994.